The Story of the Steam Stern-Wheeler 'General Gordon'. 'Good-Bye To The General'...or is it? 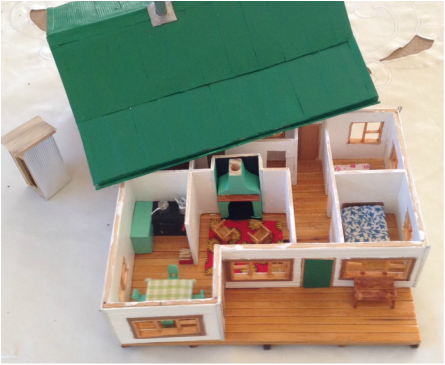 Building a major historical model diorama. 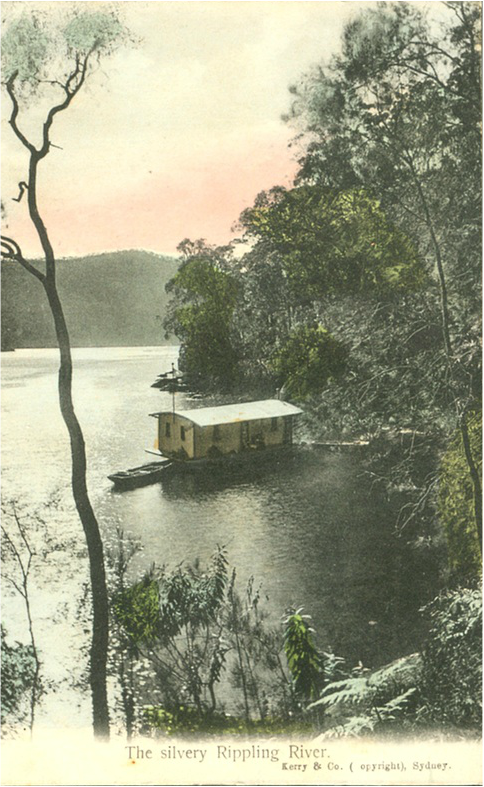 Houseboats On The Hawkesbury River. ​General Charles Gordon and Australia's Involvement in the Sudan Invasion. 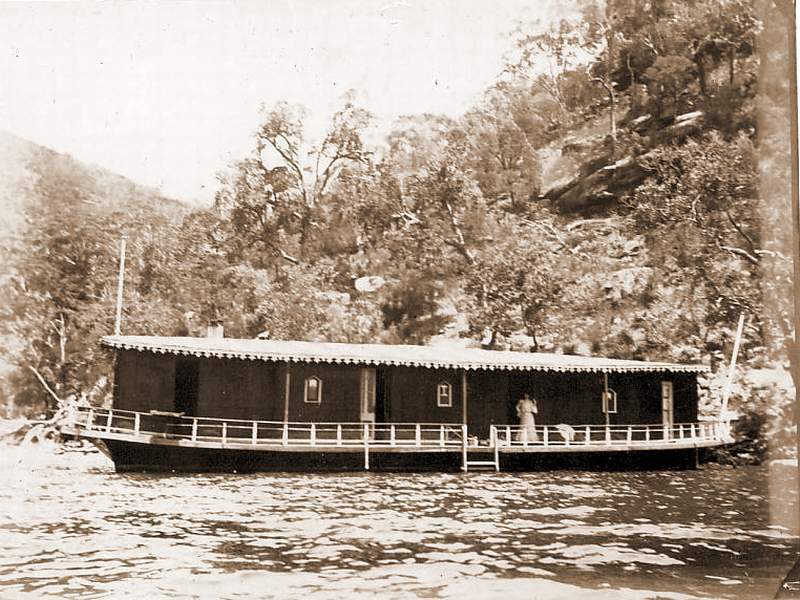 The General Gordon was originally built for the Hawkesbury River tourist trade, however, with the completion of the single track section of the Great Northern Railway between Hornsby and Hawkesbury River, the vessel was acquired by the Railways. Passengers and goods heading north could now unload at the River Platform on the eastern end of Long Island and transfer to the General Gordon for the three-hour trip out into Broken Bay and up the Brisbane Water to Gosford where the rail service recommenced. Once Australia’s longest tunnel, the 1.7 km long Woy Woy Tunnel, was opened on 15 August 1887, the trip was considerably shortened. The General Gordon then only had to cross the river and negotiate the lower reaches of Mullet Creek to reach Mullet Creek Station. 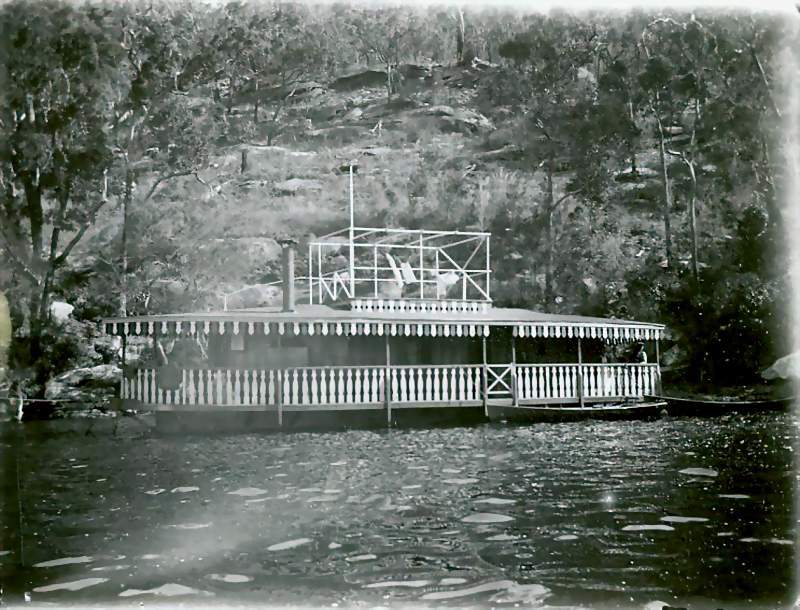 The jetty for Mullet Creek Station was a short distance north from the present Wondabyne Station which most locals would remember as the sculpture park, prior to the sculptures being moved to Kariong. 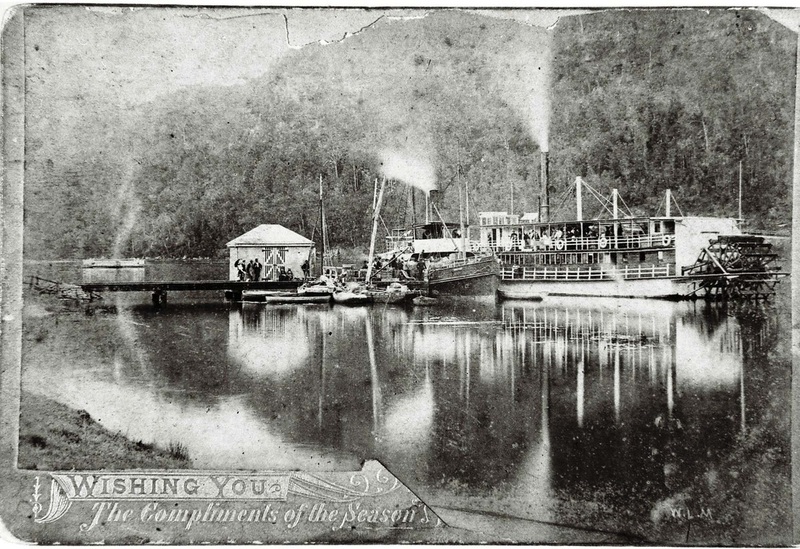 The General Gordon was a wood stern wheel paddle steamship, built by Thomas Davis at Terrigal Haven in 1886. After launching the ship it was towed to Sydney where two horizontal high pressure steam engines of 55 h.p were fitted. The engines were built in 1862 and repaired by Fulton & Co of Melbourne in 1886. General Gordon was ‘first run’ on 15 August 1887 and registered in Sydney in October 1887. Above:The General Gordon loading at River Platform, Long Island. Note: this island is a long island and was given the name well before the Americans arrived to construct the first rail bridge. 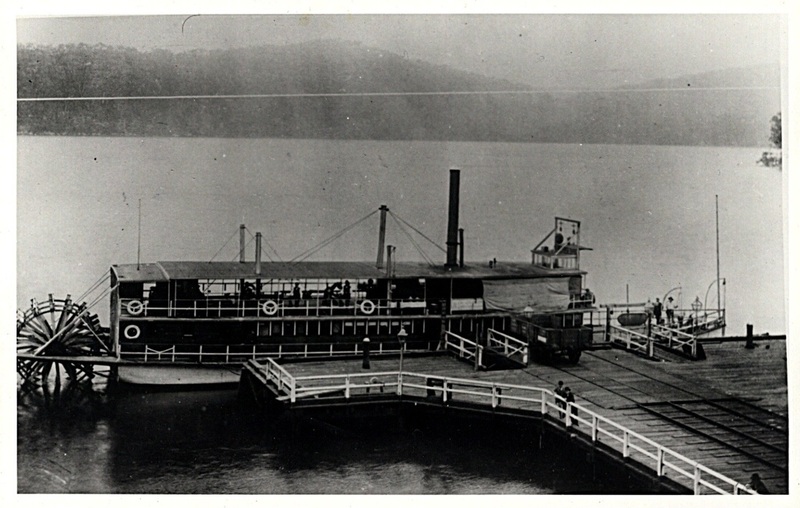 Above: The General Gordon off loading at Mullet Creek Station, a river steamer can be seen in-board of 'The General'. This is a lot clearer picture than many of the same shot and vehicular ferry, with a ramp at each end can be seen further up the creek. The General Gordon weighted 164 tons (166 631 kg) gross and 104 tons (105 668 kg) net. It had a length of 117.0 feet (35.66m), a beam of 25.6 feet (7.77m) wide and a hull of only 5 feet 4inches (1.62m) deep with a draft of 2 feet 6 inches (.76m). The vessel had two decks, the lower deck had the engines mounted aft, forward of these was an open space for general cargo etc. Forward of that open space the boiler, fire box and probably a galley were installed. The boiler was probably mounted as far forward as possible to provide maximum draft for the fire, with steam piped aft to the engines. Long connecting rods joined the engines to the stern-wheel. There were probably three or even four rudders mounted on the hull ahead of the stern-wheel. Above the main deck was the passenger deck, several terms can apply to this deck like hurricane deck, saloon deck, however, as the General Gordon's deck was mostly open it was probably called the promenade deck. The forward part of the promenade deck supported the wheel house raised about half a deck high to provide all-round view. The stern section of the promenade deck was enclosed and probably contained toilets. The forward part of the promenade deck was also enclosed and probably included a saloon. Above: The king-post can be seen aft of the funnel while the two hog-posts can be seen aft of this. The hog-rods can be seen extending from the tops of these posts, they passed through the Promenade Deck and were fixed to iron brackets on the hull. The shallow hull provided little to support itself structurally so posts called ‘king posts’ and 'hog posts’ were fitted. These were fixed to the hull with iron plates and extended above the roof of the promenade deck. Ties called hog-rods passed through the promenade deck and were fixed to the hull. Turnbuckles provided adjustment to take up the slack if either the bow or stern sagged, or released if the vessel became swaybacked. A crew of between 12 to 17 would have been required. Above: The General Gordon passes under the Hawkesbury Rail Bridge. With the opening of this bridge 'The General' reverted to the tourist trade. 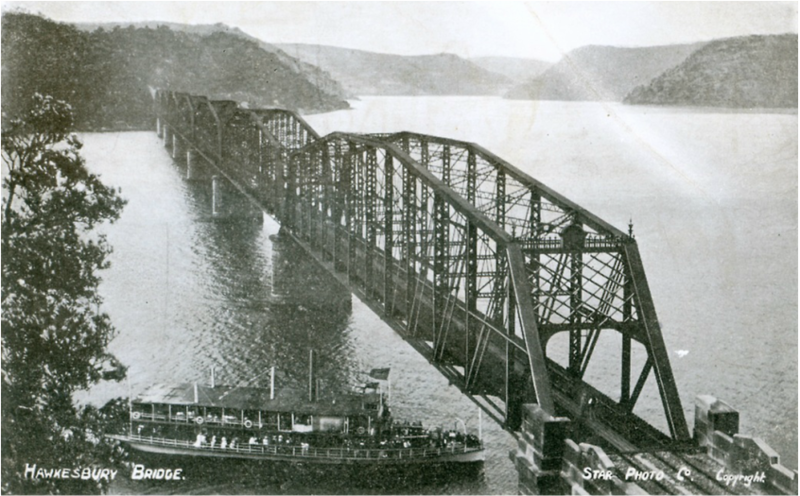 With the opening of the first Hawkesbury River Rail Bridge on May 1st 1889 the General Gordon was no longer required by the railways and reverted to the tourist trade. 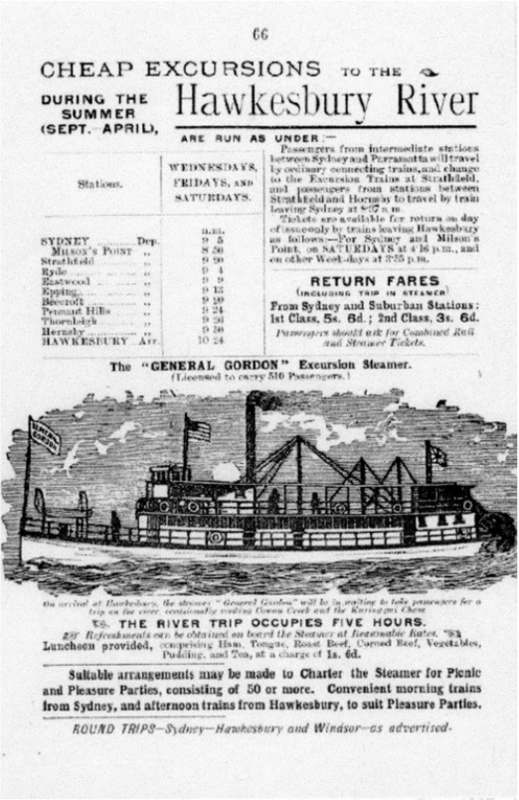 The last excursion of the General Gordon was in April 1907. The vessel was sold 27 October 1908 to an estate agent George Nipper of McMahon's Point and then on 6 November 1908 to William Arnott, a solicitor, of Pitt Street Sydney. 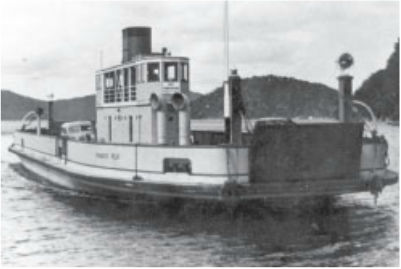 By January 1910 the registration noted the engines and boilers had been removed and the vessel had been covered to a house boat being moored to the Balmain Ferry Co’s wharf at Pearl Bay, Middle Harbour. On 13 January 1910 her registration was cancelled. Not only is General Gordon being reborn in model form, the whole Long Island wharf, station platforms, buildings, cottages, boat sheds and turntable are being recreated. In the background will be one of the longest bridges ever built in the world by 1889, supported by THE deepest piers ever sunk. Peter again went to the Australian Railway Historical Society and found a number of drawings prepared between the 1880's and the 1940's, lots of discussion developed between Ray and Peter, soon Barry joined in. All three gentlemen, hopped on a train and headed for Long Island on the Hawkesbury to see what might remain of the railway complex after almost 130 years. Top: 'The General' based on drawings by Marine Architect, Bill Bollard and the substantial wharf, Ray built according to drawings retrieved by Peter from the Australian Railway Historical Society. Above: Barry, Peter (took the photo) and Ray hopped on a train to Hawkesbury River Station and walked the old line to the Long Island railway site. Hidden by the scrub and weeds behind Barry and Ray in this photo is one remaining platform of the two originals. Above: Inspired by the site visit and working like a man possessed, Ray built the the waiting room and men's dunny, from Peter's drawings. The door at right led to the ticket office, this opened onto the waiting room. This provided access to the Ladies Waiting Room and ladies loo, the grey section at left. The 'Mens' was a separate building. Ray also started on the two cottages and boat shed that were shown on the drawings and parts of which could be seen in the old photos on hand. At first Ray attracted a bit of criticism for making the front windows too big, resembling more a 1950's cottage than the 1880's. There was method to his madness and once he had completed the interior of the cottage, it became clear why a little artistic licence was used on the windows. It looks so good it will now have to have some lighting. Note: the corrugated iron out house. The report on the fate of General Gordon is that it was sold to Edward C. Windybank and it was 'cut in two as house boats, then cut in two, each, again'. 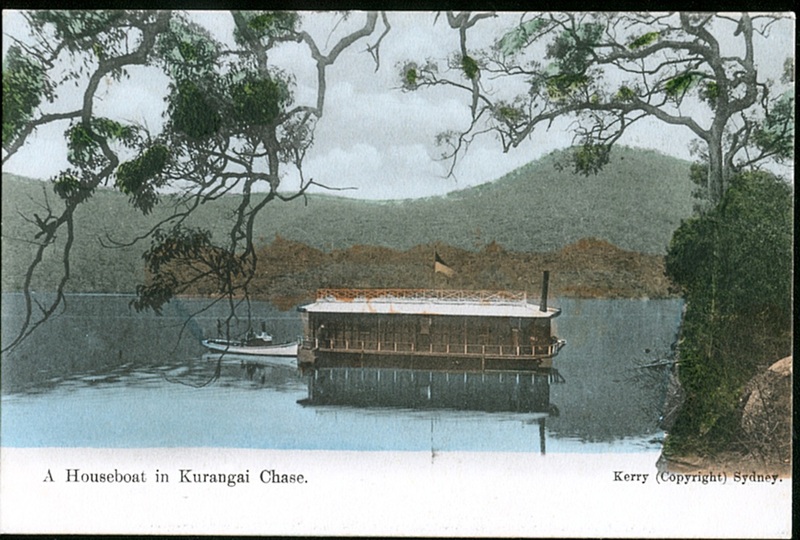 House boats were very popular at the time. Gwen Dundon and Graeme Andrews for providing pictures and much of the information. Bill Bollard for the original General Gordon drawings. Peter Rea for the updated General Gordon drawings as additional information was found. 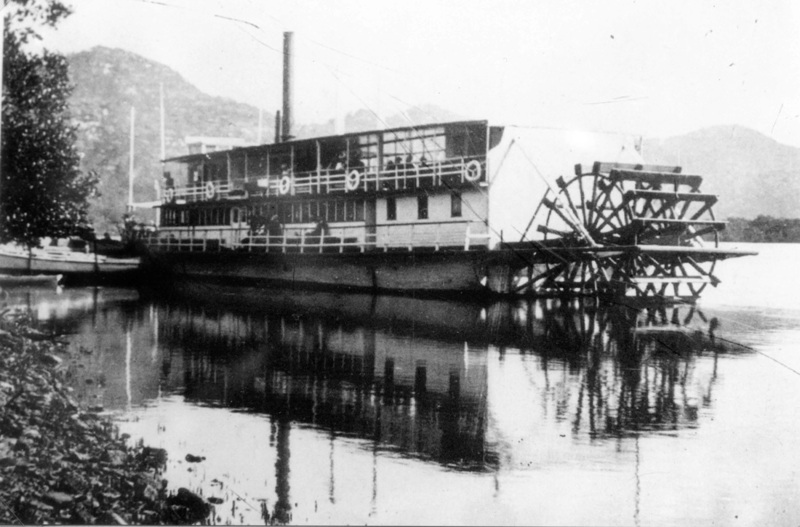 The steam stern-wheeler 'General Gordon' was named after General Charles Gordon. The exhibition will provide background to the story of General Gordon's ill-fated decision to defend Khartoum in 1884-1885. Gordon died in the final fighting. It would be another decade before Britain would launch a invasion of Sudan. By that time the European 'Scramble for Africa' was in full swing and the strategic importance of Sudan being positioned to control shipping in Suez Cannel was realised. In 1896, a formidable, well equiped army led by Lord Horatio Herbert Kitchener was sent to Sudan. Part of the justification for this was revenge for Gordon’s death and of course while doing so reconquer Sudan for Britain. The original Gordon relief force was allocated £300,000 by Parliament, Kitchiner's invasion was allocated a military budget of £11.5 million. To oppose Kitchener, the Sudan raised an army of 52,000 warriors. Following Canada’s offer of troops, the NSW government cabled London with its own offer. To make its proposal more attractive, it offered to meet the contingent’s expenses. The contingent, of 522 men and 24 of offcers of infantry and an artillery battery of 212 men, was ready to sail on 3 March 1885. The send-off was described as the most festive occasion in the colony’s history. Support was not, however, universal, and many viewed the proceedings with indifference or even hostility. The contingent anchored at Suakin, on 29 March 1885 and advanced as part of a 10,000 man square. 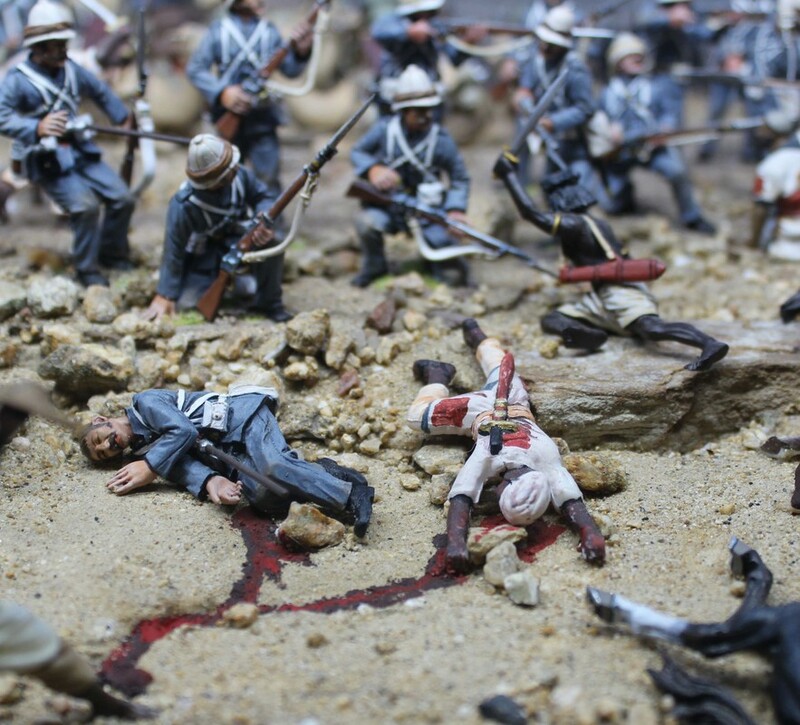 There was little action for the Australians although some skirmishes did occur. The young Australians were shocked when they came across the site of a battle that occurred 11 days before. On 2 September 1898 Kitchener’s troops defeated the Mahdist army at the Battle of Omdurman. The British force lost 700 killed while the native Sudan forces lost 25,000. The number of civilian casualties that died as a result of the war in unknown. were held for ten years, the men for twelve. After their return to Sudan they were held under house arrest for the rest of their lives. The returning Australians were disappointed to not immediately march through Sydney, being quarantined for some time at North Head. They did finally march and in pouring rain at Victoria Barracks they were informed in numerous speeches of the significance of their efforts in Australia’s first overseas military adventure. 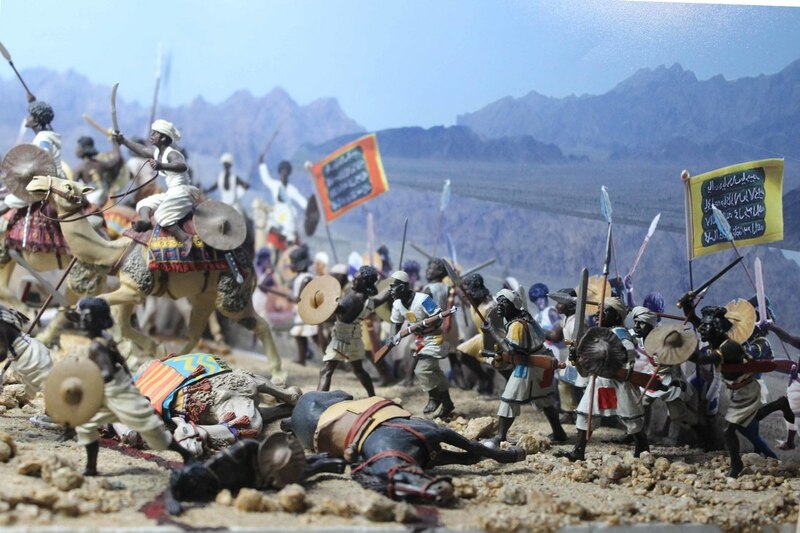 Above: Diorama of the 1886 Khartoum relief force under attack. 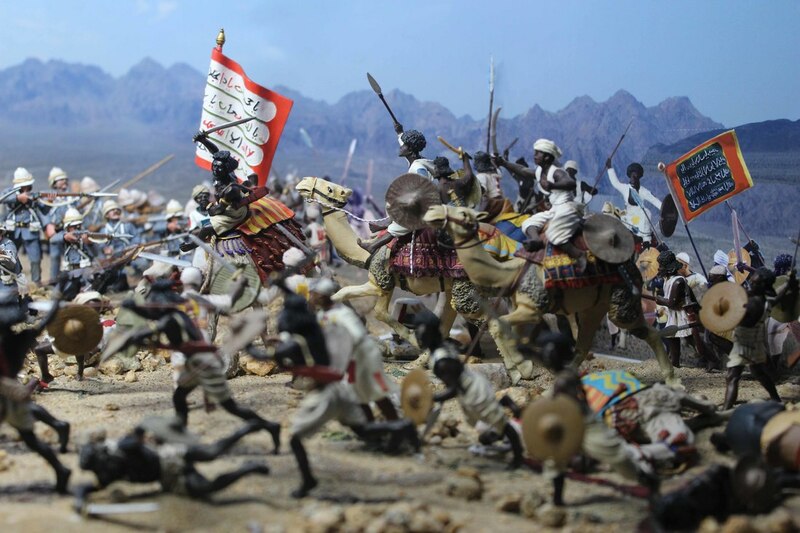 Above: Sudanese warriors advance against the British left, the Khartoum relief column having formed into a defensive square. 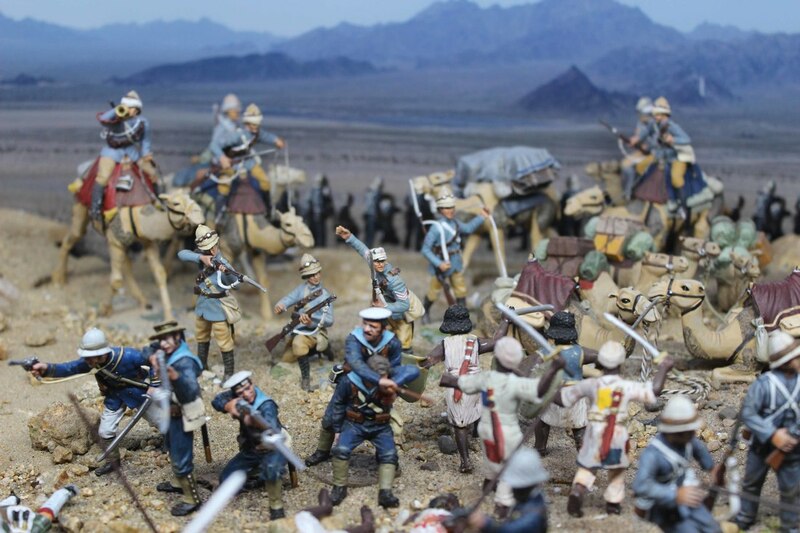 The figurines are a combination of 'Armies in Plastic', 'Britians' and 'Jenkins' products. Above: On the British left a similar attack takes place, the figures are from the same sources. Above: Gordon Highlanders, resplendent in proper regimental colours prepare for the next onslaught on the left. Above:Above: On the left Royal Marines also come under attack. Above: The diorama shows two regimental uniforms the 'Gordon Highlanders' and 'Royal Marines' who are formed as part of a defensive square. In the middle of the scene is a depiction of an event at the Battle of Abu Klea, The Royal Navy contingent operating the Gardner Gun experienced the gun jamming after firing only 70 rounds. Some of the sailors were cut down, while the others fell back allowing the Sudanese into the square, which they found blocked by camels. 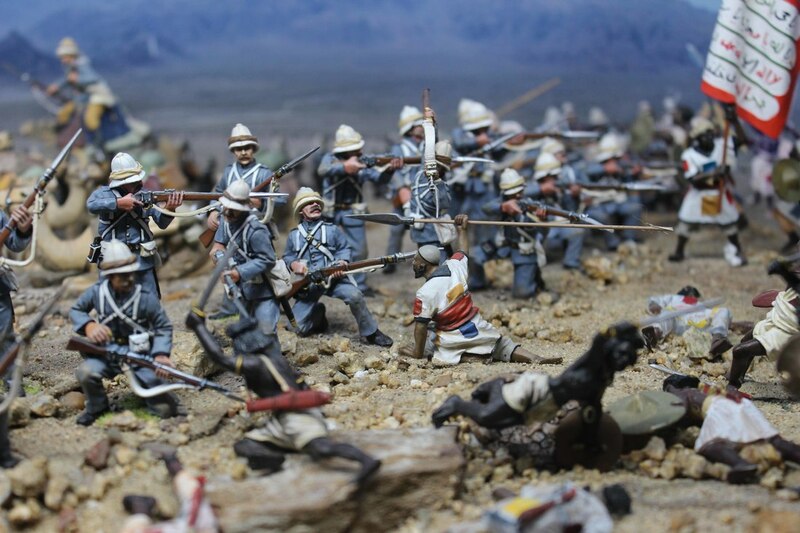 To display the uniforms the diorama also depicts the Camel Corps rushing to fill the gap. The Sudanese were actually forced to retire when the ranks behind the camels turned their weapons on the Sudanese in the square. Above: British Christian blood and Sudanese Muslim blood mixes before it disappears into the desert sand. PREVIEW OF ANOTHER MODEL OF A VESSEL WHICH CROSSED THE HAWKESBURY. I was fortunate to have a man come on one of my history ferry tours who gave me drawings of one of the Peat Vehicle Ferries. 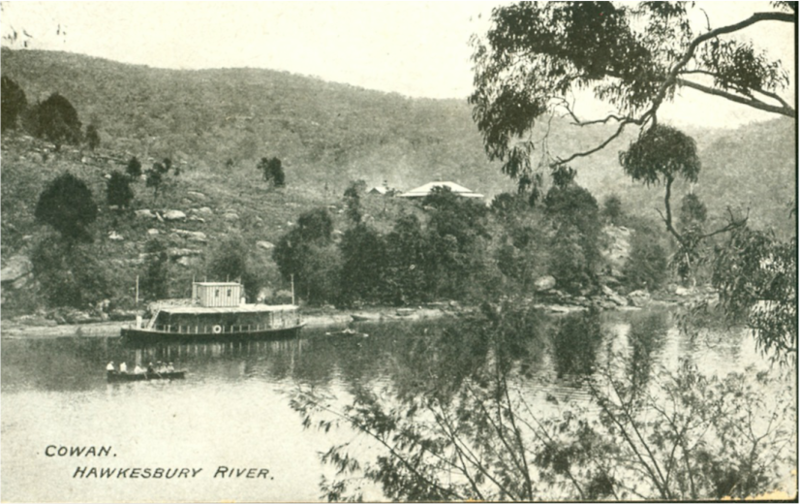 This vessel took vehicles across the Hawkesbury prior to the first road bridge being opened just after WWII. In May 2017 Ray crawley made a start on a 1:48 scale model and a 1:144 scale diorama of the entire 1880's Hawkesbury River Rail/Ferry interchange. 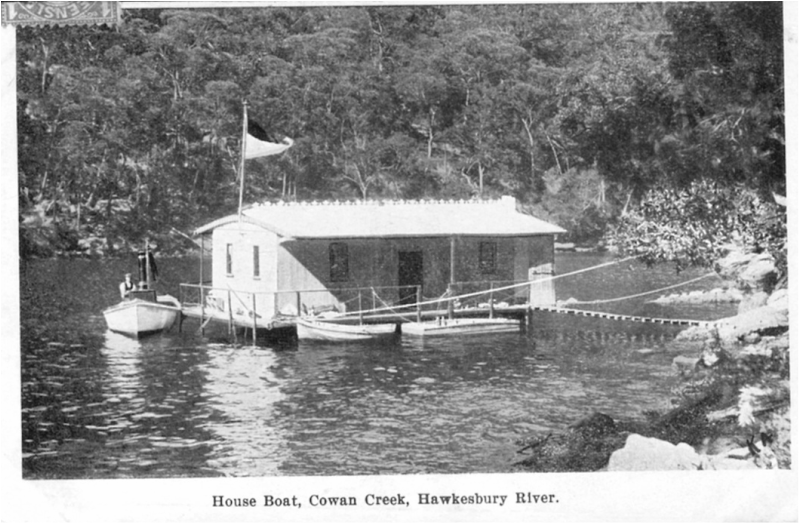 Right: Frances Peat on the Hawkesbury in 1939.